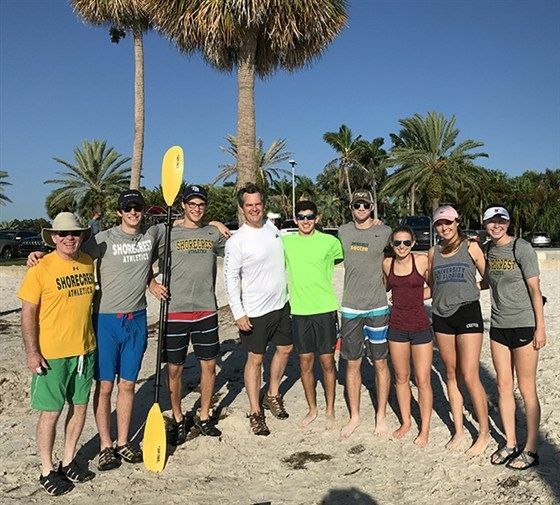 On Sunday, October 14, 2018, in 13-mph winds, nine paddlers launched from North Shore Park beach, the 1923 location of Shorecrest Outdoor School, to kayak to the current Shorecrest Preparatory School campus. Under sunny skies and a big headwind, Headmaster Mike Murphy, seniors Trevor Bernstein, Chris Canizares, Sophie Elwyn, Reagan Quilty, Lily Schneider, and Walker Willis, along with alumni Bob Willis, Jr. ’77 and Jackson Willis ’15, jumped in the new, bright green kayaks Walker secured for Shorecrest students to use. Bill Jackson’s dropped the kayaks off on the sandy beach early, and by 9am the team was paddling straight into the sun and wind, pointed toward Smacks Bayou. The early part of the paddle was very difficult, but any complaints were blown away by the wind. When they reached Smacks Bayou, north of Snell Isle, the protected water cut the wind and the paddlers could talk and enjoy the scenery. Dogs barked from docks, fishermen waved, and fish darted through the green waters. When they approached Placido Bayou, the scenery became more beautiful - and confusing! Placido Bayou is dotted with sprawling, large mangrove islands to the east, and to the west spans an endless bank of thick mangroves. The group claims they never got lost and they were only “mildly perplexed” at times. The Shorecrest Paddlers ventured down several cuts in the tight mangroves in search of the school, and finally came upon the 54th Ave Canal — the long, rather deep estuary that leads to Shorecrest. Two and a half hours after setting out, cheerful (but tired) paddlers completed their historic journey from the old Shorecrest campus to the current one. They landed at the Native Classroom site, and pulled their muddy kayaks out on to the shell trail at the observation platform. As good stewards, they disposed of trash picked up along the way, cleaned the equipment, and stored the kayaks for later use by Shorecrest students and the Outdoor Club. Thank you, Walker Willis ‘19, for securing the kayaks (with donations from friends and a big discount from Darry Jackson!) and for mapping the journey. Thank you, Mr. Murphy and alumni for coming along for the adventure. And thank you, seniors, for your intrepid search through the mangroves for your school home: Paddle On!